Eleven-year-old Cady has the supernatural Talent of knowing the perfect cake for someone just by meeting them—and then she can make it better than anyone else in the world. Miss Mallory has the Talent of matching orphans to their perfect family—sometimes within hours—but in all the years that Cady has lived at the orphanage, Miss Mallory has never found the right family for this sweet, quiet girl. A young man sets out in life with a powder-blue suitcase, a slip of paper with the key to his fortune tucked inside the lining. Alas, the bag is stolen at the train station. The next time we see him, fifty years later, he is a bitter old man who runs The Lost Luggage Emporium, buying and selling used suitcases. He is still hoping to find that paper. The upstairs portion of the Emporium consists of rented rooms inhabited by Mrs. Asher of the troublesome hairpin; her disgruntled teenage son Zane, whose Talent is spitting; her son Will, whose Talent is disappearing; her daughter Marigold, who is desperate to find her Talent; an elderly lady who never speaks; and a younger man who may not be exactly what he seems. 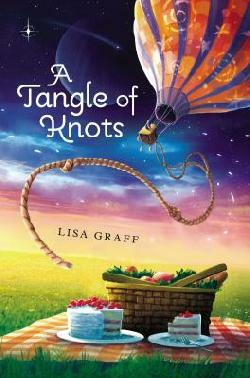 Lisa Graff spins out each character’s story and slowly weaves them together as she reveals the answer to the mystery of Cady’s true identity. In between the chapters are recipes for the cakes that Cady makes for each person, all of them perfect, of course. The good characters in this story are thoroughly winsome, and the villains are truly odious. Will little Cady ever have someone to love and care for her permanently, and what will happen to the gentle Miss Mallory if Cady does leave her? I am not convinced that this will be a Newbery winner, just because the theme and writing style are not quite substantive enough, although I enjoyed it very much and intend to give it to several readers immediately. A puzzle of a tale, charmingly told. Recommended for ages 9 and up.